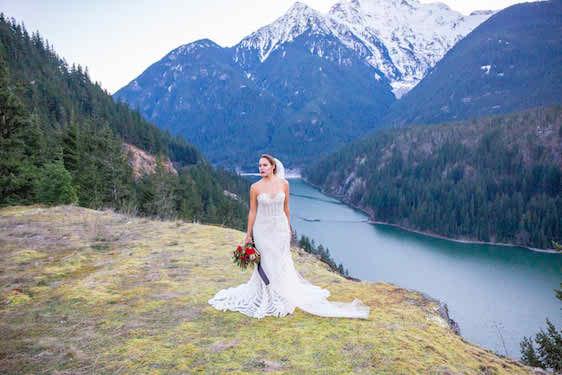 Captured beautifully by photographer, Solie Designs and with event planning and design by Lori Losee of Elegant Affairs, Lake Diablo in Washington State is known for it's stunning views, bright blue waters, and it's undeniable ability to inspire wanderlust! Make no mistake about it, m'loves, this shoot is absolutely for color-lovers! Let's take a closer look, shall we? The mountaintops make it just so epic! Oh, and what's not to love about this amazing cake design by The Cakewalk Shop? A sweetheart style neckline looks feminine and oh-so pretty! And this table design? I'm truly in love. This vibrant purple shade really pops! Wouldn't you agree? Oh, and can we talk about this gorgeous gown? And I just love the silk ribbons on this bouquet! And so absolutely pin-worthy, if you ask me! And these gorgeous pops of color? Swoon. And second wedding gown? Look how gorgeous this full skirt is! And ahhhh, this view! Care for some wine? So much to love about this shot! A girl friday event absolutely killed it with this gorgeous stationery suite! And this cake design? This is what wedding cake dreams are made of, m'dears! So much love for this creative wedding inspiration — It's what happens when bold color meets west coast wanderlust. It's one part modern, one part whimsical, and a whole lot of gorgeous! No Comment to " Colorful Wedding Inspiration at Lake Diablo in WA State "